The DAR Service for Veterans Committee continues to thank our men and women for their service to our country. The DAR Service for Veterans Committee works to find new and better ways to serve our veterans. The Daughters of Sallie Harrison Chapter also support our Florida State Regents' Project for homeless women veterans. Members of the Sallie Harrison Chapter with State Regent Cynthia Wolfe Symanek at the Volusia Flagler Seminole Regents' Council Veterans Luncheon. The DAR Service for Veterans Committee works with both Seminole County and Orlando to help supply items needed for their Stand Downs. These events provide homeless and at-risk veterans needed assistance and services in one location. Typically provides services to around 95 veterans. Last year, 28 non-VA service providers and 267 volunteers providing services to 323 veterans. The Stand Downs provide job, healthcare, housing and Veterans Administration contacts to men and women who served in the armed forces. Sponsored by the Southeastern Guide Dogs, Paws for Patriots pairs highly trained guide dogs with visually impaired veterans. In addition, they also train Veteran Service Dogs and place exceptional dogs into careers benefiting veterans who suffer from Post- Traumatic Stress. These programs enable our veterans to gain confidence from these dogs, expand their lives, regain mobility and independence, and re-integrate into their communities. 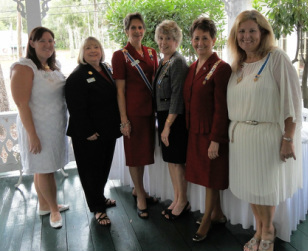 The Sallie Harrison Chapter continues to support this past State Regent's Project through donations and education in coordination with the Florida State Society Daughters of the American Revolution. 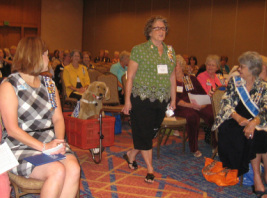 Chapter member Judy Wells speaks to Florida Daughters about the importance of the continued support of Paws for Patriots to support the Southeastern Guide Dog Program.